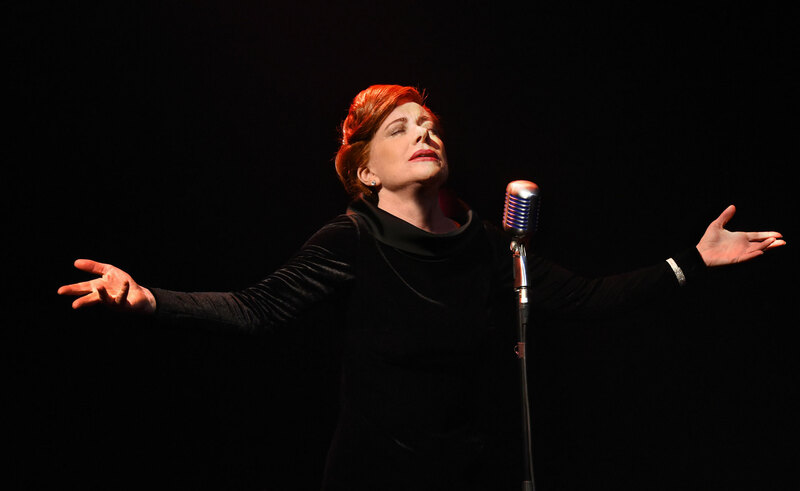 Her theatrical star firmly established by the extraordinary success of Songs for Nobodies (2010), a show that just toured and toured, audiences know what to expect from Robinson, and The Show Goes On certainly delivers. Melbourne Theatre Company struck gold with Songs for Nobodies, penned by renowned Australian playwright Joanna Murray-Smith and guided confidently to the stage by director Simon Phillips. The company reunited Robinson with the dream team of Murray-Smith and Phillips for Pennsylvania Avenue, but the result was a classic example of the law of diminishing returns. In place of deft simplicity was a more convoluted emotional story, and although Robinson’s talent shone through, the new show did not engage on the same level. Fortunately, The Show Goes On applies the tried and true approach of “less is more,” keeping the focus squarely on the music and Robinson’s extraordinary voice. Serving as co-creator, with Robinson, director Richard Carroll facilitates a streamlined approach that keeps the action flowing from song to all-time classic song. Robinson could very easily make a star’s entrance to rapturous applause, but we are not here to see her; it is the myriad of iconic female singers she is about to summon that are the chief attraction. Robinson simply inhabits each woman, subtly changing her body language and facial expression as her singing voice progresses through a rather incredible variety of styles. Transitioning swiftly from woman to woman is amazing enough, but in one unforgettable number, Robinson sings a duet between Judy Garland and Barbara Streisand, “Get Happy / Don’t Rain On My Parade,” flitting from voice to voice with flawless dexterity. Technically, the dialogue from each singer is a series of anecdotes, yet Robinson makes the words seem to flow spontaneously. More significantly, the stories and messages have been chosen for their uplifting values, progressively conveying a sense of optimism and aspirational virtue. Robinson and Carroll have nothing but respect for their subjects; nothing is sensationalised and nothing is done for mere laughs. Carroll has helped to shape the show as a journey, saving some key vocal highlights for the latter part of the program. Edith Piaf standard “Non, Je Ne Regrette Rien” is a real showstopper, and Tosca’s “Vissi d’Arte,” as sung by Maria Callas, reveals further facets of the beauty and power of Robinson’s voice. While a cabaret venue would probably be the optimal setting, the curved, raked auditorium of Fairfax Studio allows a close connection between audience and star. The straightforward setting places three musicians behind a scrim, with the perforance space marked out by studded floor globes. Lighting designer Trent Suidgeest has made excellent use of these lights, telling a story with colour and patterns. In a highlight of the staging, there is a recap of the show told in a musical mash up as each singer’s signature colour and pattern in lights is recapped with evocative precision. Musical director Martine Wengrow joins two fellow musicians in a creating a deceptively lush, and very flexible, accompaniment. 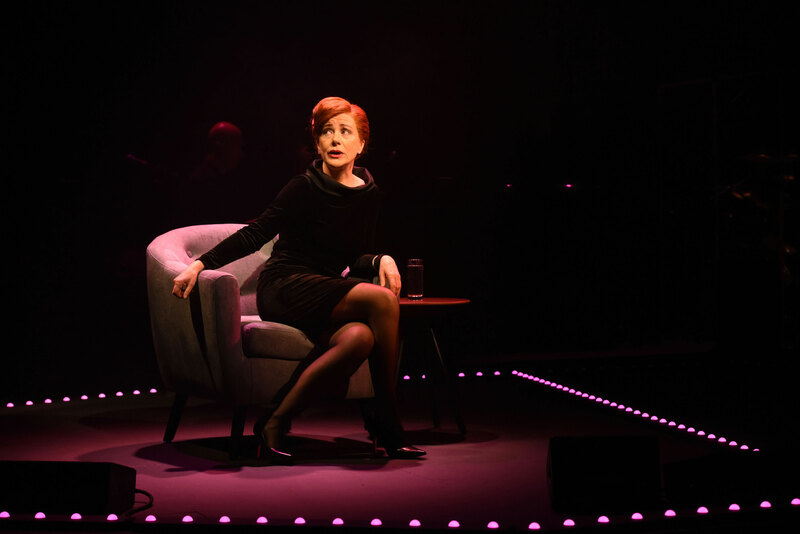 Bernadette Robinson: The Show Goes On plays at Fairfax Studio, Arts Centre Melbourne until 11 March 2018.